The Fiber Laser FL-50 laser marking and engraving machine offers greatest output power to fit on the most demanding laser marking applications; ultra high speed marking and deep laser engraving. Its fiber laser engine with 50 Watts of maximum output power offers high power peaks, fast processing times and maximum application flexibility to mark with total quality and precision in all types of industrial parts and materials; metals, alloys and most plastics. When laser marking process is required to be completed in a extremely short cycle time the FL-50 laser marking system is the perfect solution. Thanks to its 50 watts of output power adjusting the marking time to the requirements of the production is easily achievable. When the application requires an especially high marking depth on the hardest metals, the FL-50 marking laser perfectly covers its purpose, increasing the possibilities of using the machine to any laser engraving application. The functionality of the Fiber Laser FL-50 for dynamic marking of moving parts (fly marking) is reinforced thanks to its great power, allowing to easily solve the most demanding marking applications into fully automated manufacturing lines. 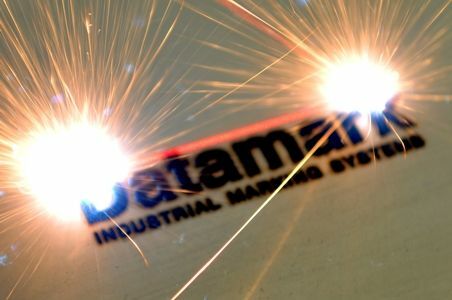 Fast laser marking into production lines. Maximum laser output power 50W.